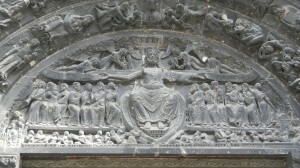 The first Gothic facade differs from Indian art’s panoramic perspectives. The West advanced beyond its simple Romanesque forms in its own terms. This was the first part of the church that Abbot Suger remodeled as he pioneered Gothic style. A new world was about to open up. The entrance was the first that expanded from the flat Romanesque planes and synthesized sculpture with the architecture. 1. Centers you on one great figure: humanity’s one and only savior. 2. Portrays all figures in the scene in geometric order. This geometry is like the facade–proportioned. 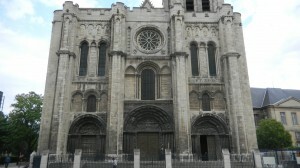 The facade is divided into three sections by huge wall buttresses. 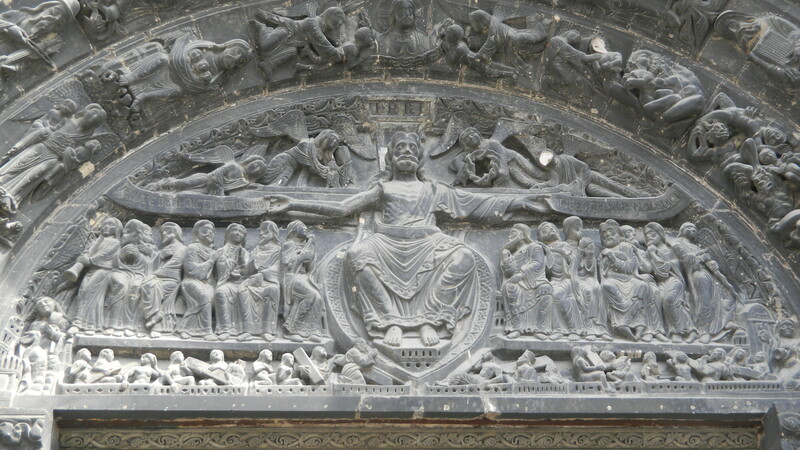 The Last Judgment is over the middle door, so the entire facade focuses your gaze on Jesus, and this all-important event. The Last Judgment is a once-and-for-all affair. Christianity doesn’t believe in the vast temporal cycles of repeating eras, or in long processes of reincarnation that much Indian thought has focused on. As the West moved from Romanesque style to the more life-like images of Gothic style, it used the ancient Greek focus on linear order and static geometric ratios. Before the late 20th century, it was common to sharply divide the ancient, medieval and modern eras. But there’s a lot of continuity in the entire Western tradition. All eras have enjoyed linear and rhythmic clarity. 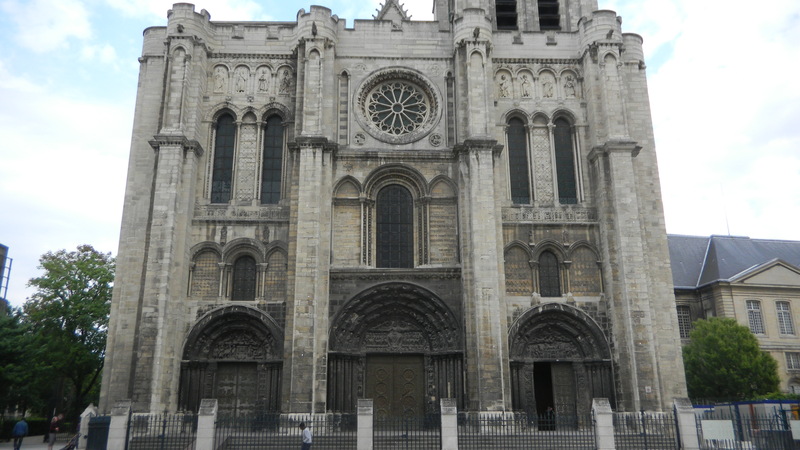 But Abbot Suger was pioneering new standards of realism, and the entrance facade of St. Denis was only a beginning. We’ll enter the church in the next post, Gothic Style Part Three, and see that this developing realism was more complex, and potentially troublesome, than Suger probably imagined.